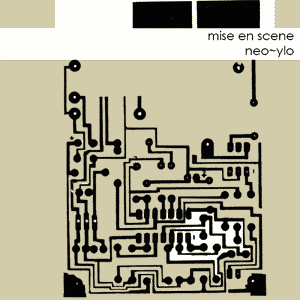 Mise en Scene's first solo release on Boltfish follows his successful appearance on our Tandem Series alongside dooQ in July 2006. With Neo~ylo he returns on blistering form and with a grittier development of his sound. As with our previous 3 inch outings, this is a strictly limited release. "The latest appearance (and debut if I’m not grossly mistaken) by Mise en Scene was on the Tandem Series number 4. Neo~ylo is broken and quite mechanical sounding as in D:great or the title track Neo~ylo. Overall there’s a great selection of more or less nervous and disjointed sounds on this five track EP. It’s somewhat different from his previous Tandem Series number 4 release and not your typical Boltfish release either for that matter. Neo~ylo is an interesting sonic encounter and counts in as BOLT040." "This limited little (3") gem lasts only eighteen or so minutes, but those minutes are packed to the rafters with little sonic details that demand repeated listening. Israel's Shay Nassi is a relative newcomer, having done some remix work for label-mate Preston, and sharing an aluminum platter with dooQ. Nassi plants his flag firmly in the rich soil of IDM, staking a claim on the more melodic side of the genre, branching into ambient realms (bookends "fog:water" and "water") and hitting the dance floor ("d:great") as well. Nassi also appears to have worshipped at the shrine of (dare we say) Autechre, but his work bears the imprimatur of TriRepetae, i.e., complex beat structures, minor-key synth work, etc. Neo~Ylo doesn't transcend its influences, nor does it merely ape them. Should Nassi get a full-length under his belt, or a couple more of these tasty appetizers, he may be able to shake the Booth/Brown shackles (for that is what they really are) and fly. Checking the Boltfish website, this appears to be sold out, which is a shame. Have more faith in the size of your audience, dear Boltfish, and repress this. In time, this may be recognized as the beginning of something wonderful. " "Hoorah! Once again it's Boltfish Limited edition time. Another quirked out, nicely presented 3" CD from one of our fave labels and it comes from previous Tandem Series starring bod Mise En Scene. This release ups the crispy quota considerably and provides a nice counterpoint to the more melodic releases on the label by firing a series of top quality, rhythmically dynamic Electronica cuts at us and hitting the target right in the old bullseye. The intro track leads you in gently and then... boom... it's all full steam ahead with precision cut ups, beautifully dense programming and little touches of brilliant sound design all sitting more than happily in the mix. Upbeat, chunky, full of mutant robo-funk... this is a brill release that more than deserves your attention. As ever with these 3" CDs it's a limited edition... you have been warned! Essential gear"
"Behind Mise En Scene is an Israeli from Haifa by the name of Shay Nassi. He has been producing 'experimental IDM and melodic glitch since 2000', so says Boltfish, who with 'Neo~ylo' produce the second release by, following a split release with DooQ. In the twenty minutes that the 3" format allows him, he produces five tracks of stuttery beats (the experimental IDM) and computerized sounds (the melodic glitch). It doesn't come closer however to the melodic and melancholiac imprint that some of the other artists on the Boltfish label have. The material is rather a bit more low resolution and edgier, or even more grittier than some of the others, which is nice, because it sets Nassi apart." "The welcome return to these pages for IDM experimentalist Shay Nassi - better known to the more acute pulse fingered electronic community as Mise en Scene. Extremely limited we are advised, this 5 track 3 inch CD follows hot on the heels of his split appearance on the very excellent split Tandem series (via the same label) where he was found pitting his wits against DOOQ. In many ways ‘neo-ylo’ provides for a sharply contrasting sonic suite as was earlier indicated and provided for on the aforementioned ‘Tandem’ set by serving up what can only be described as five slices of (far) left field abstract futuro funk shot through with manipulated creaks and whirrs that appear to awkwardly body pop in mechanical ether. The minimalist ’d:great’ stutters and punctuates precariously amid twinkling streams of excitable binary chatter briefly braided by sparsely crafted lilting lunar-esque suite, android ambience cued distantly from Herbie Hancock’s ’Rock It’ albeit that is having been placed in a biscuit tin and shaken to death. Title track ’neo-ylo’ is a bleak re-drill in some respects of ’d:great’, treated to brief dislocated bursts of break beats it plays host to a curious bent out of shape jazz vibe hats achingly decorated in hurting cosmic swirls as though it was the last may day transmission of a civilisation long since dead, forgotten and undiscovered. ’prepare:archive’ is by far the best cut here a rampantly buzzing head trip of sorts that aside tapping cleverly in the world of Wagon Christ as though on speed, craftily centres upon Raymond Scott’s pre electronic period and up dates his mid 30’s jazz styled erratic ‘Powerhouse’ period although admittedly with shades of Glass and Stockhausen in the mix. The set is beautifully book ended by the lulling and crystalline ‘fog:water’ and ‘water’ who both serve as shimmering reprises carved in chambers of ice - spectral lullabies for Huey and Duey if you like. Absolutely recommended. "